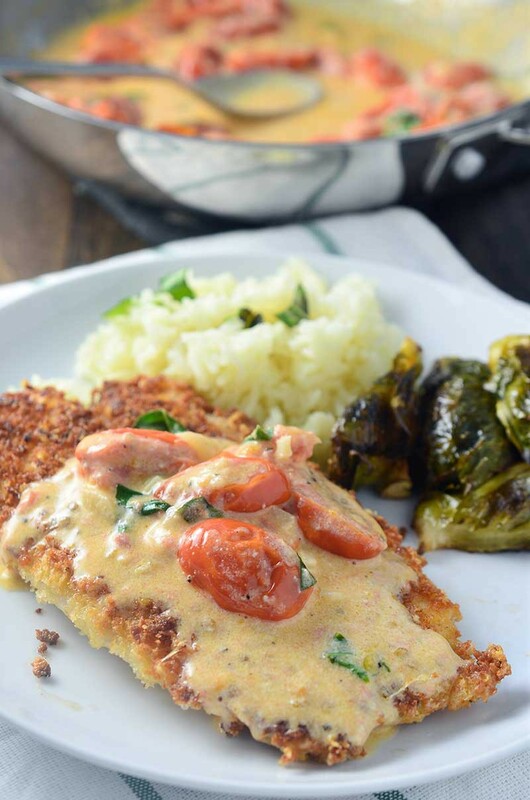 Parmesan crusted tilapia with tomato-basil cream sauce is a quick and easy dinner recipe that the whole family will love. 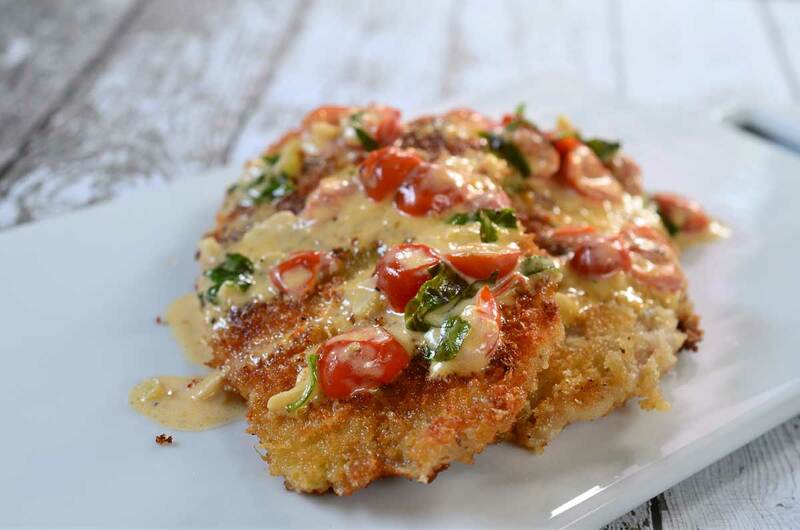 Pan fried tilapia with Parmesan and panko breading with a delectable creamy tomato-basil sauce. During high school and collage, I worked at a seafood restaurant. Working in a seafood restaurant introduced me to a lot of different kinds of fish. One being tilapia. Tilapia has since become one of may favorite pieces of fish to cook. 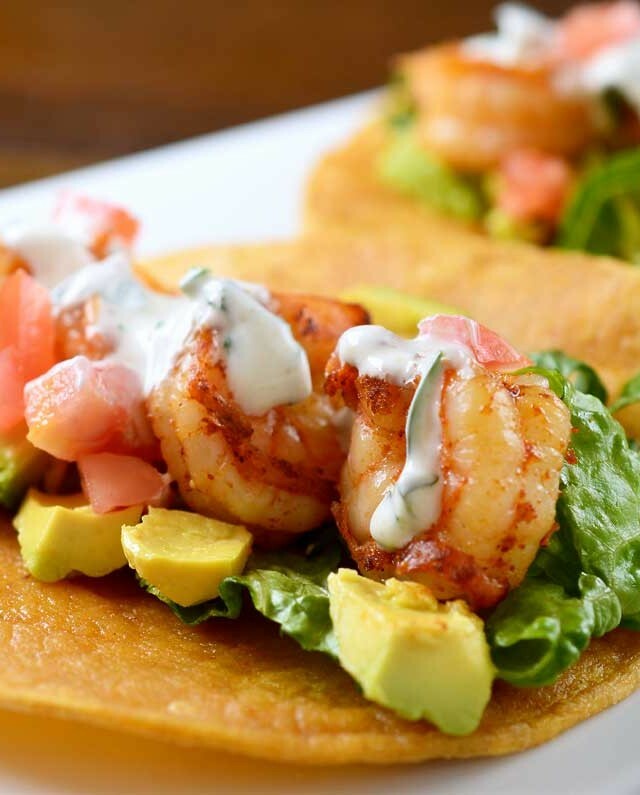 Not only is it mild but it is also very inexpensive and easy make at home. 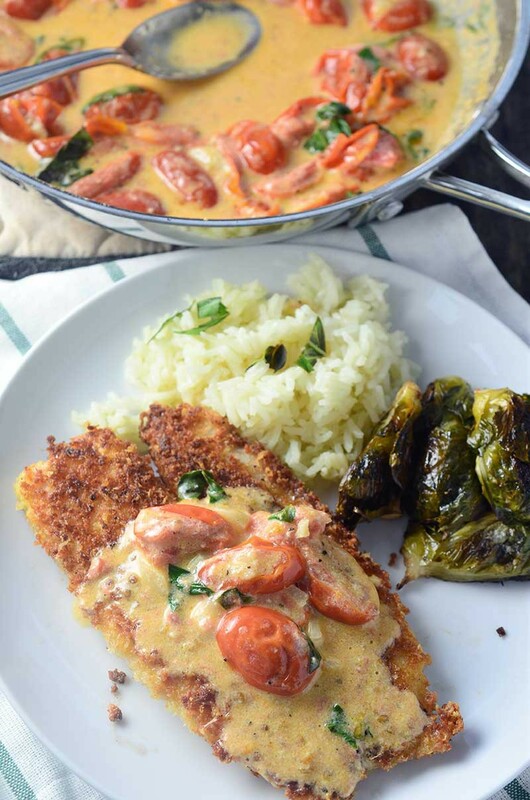 To make this easy fish recipe, simply coat tilapia in parmesan and panko, pan fry to golden brown and topped with creamy tomato sauce. 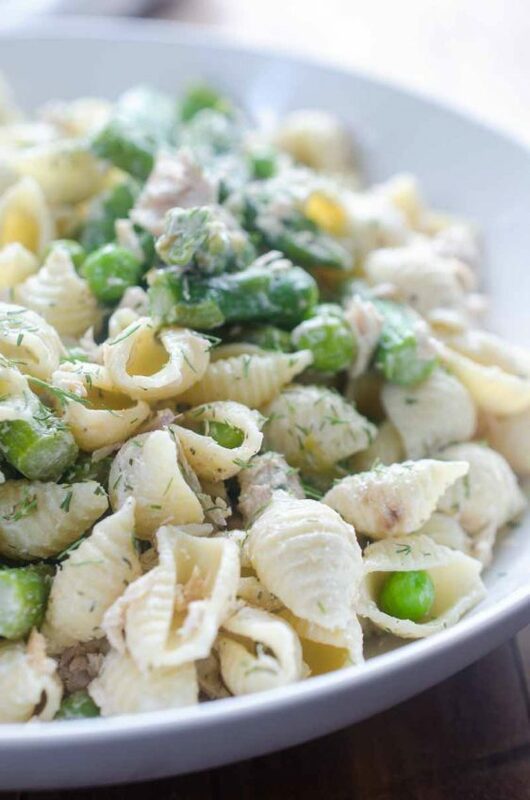 It is fast, delicious and the perfect summer meal. How do you make Parmesan Crusted Tilapia? It took me a few tries to get the coating just right for this Parmesan Crusted Tilapia. The first time I tried there was virtually no Parmesan breading left on the fish. Not one to give up, I did a little more testing. What I found with further testing, was that it was best to lightly dust the fish in seasoned flour first, then dip it in egg before finally dredging it in the Parmesan panko mixture and frying it. This method, coats the fish perfectly. Why panko bread crumbs instead of traditional bread crumbs? Panko bread crumbs are my go-to bread crumbs in the kitchen. I prefer to use panko bread crumbs because they give an extra crisp to everything. You don’t need a lot of oil to cook this Parmesan Crusted Tilapia. Just enough oil to coat the bottom of the pan, about 3 tablespoons, is fine. I could’ve just left it like that. Parmesan Crusted Tilapia is pretty great on it’s own. But with it being summer, I figured why not add in some quintessential summer flavors. That is where the basil and tomato come in. And believe me, friends, the tomato basil cream sauce really sends this dish over the top. It’s not too heavy. It’s is just creamy enough and the tomatoes and basil add a slightly sweet flavor that contrasts nicely with the salty parmesan. It might be hard to resist licking the plate but if you’ve got company try soaking up any leftover sauce with some crusty herb garlic bread. 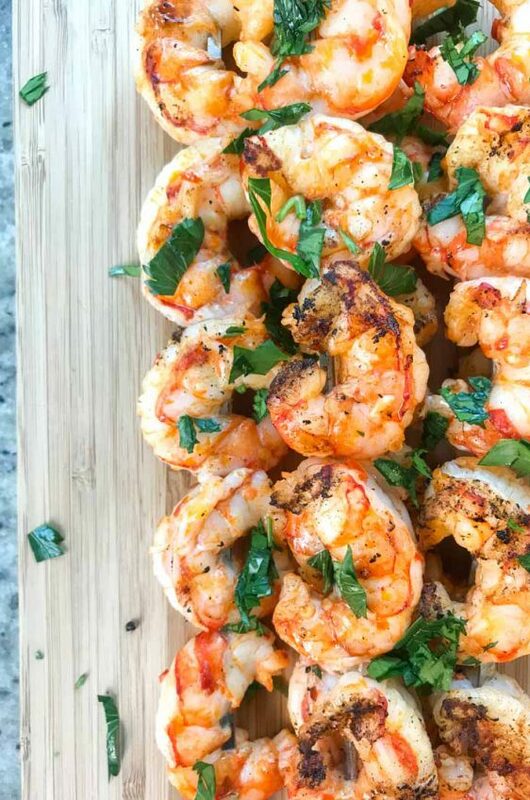 You could also serve this alongside some roasted red potatoes and salad with Pesto Vinaigrette. Should I use frozen or fresh fish? There is always much debate about this. Some will say “ONLY USE FRESH!” But in our house we use both. I use fresh when I can get it but frozen works well too. Either would work for this recipe. If you’re interested in learning a bit more about the pros and cons of frozen versus fresh here is a good article from Epicurious. Can you substitute another kind of fish for tilapia? You betcha! If you don’t have any tilapia on hand, or can’t find it at your grocery store, this recipe would work for any kind of white fish. Two of our favorites are cod and sole. Both are mild white fish that are relatively easy to find in the grocery store. Note: This recipe for Parmesan Crusted Tilapia was originally published in 2009 and republished with updated photos in 2016. Heat olive oil in a small skillet over medium heat. Add garlic and cook 1-2 minutes. Add cherry tomatoes and cook for 2 minutes. Reduce heat to medium low and add cream. Let simmer for 15 minutes. Sauce will turn slightly pink and coat the back of the spoon. (Note: It is okay if the sauce boils slightly.) Season to taste with salt and pepper. Meanwhile, pour enough oil just to coat the bottom of a skillet and heat over medium heat. Rinse and pat dry the tilapia fillets. Season both sides with kosher salt and fresh cracked pepper. Combine Parmesan, panko and granulated garlic. Dredge the seasoned tilapia fillets in the flour. Shake off excess. Dip in egg. Press into Parmesan/panko mixture. Place fish in heated skillet, in batches if necessary and cook 3-4 minutes per side. Fish will be golden brown and will flake easily when done. When you remove the fish, chiffonnade the basil (Note: To do this, simply roll up a few basil leaves and gently chop). Stir the basil into the sauce. Season with salt and pepper if needed. 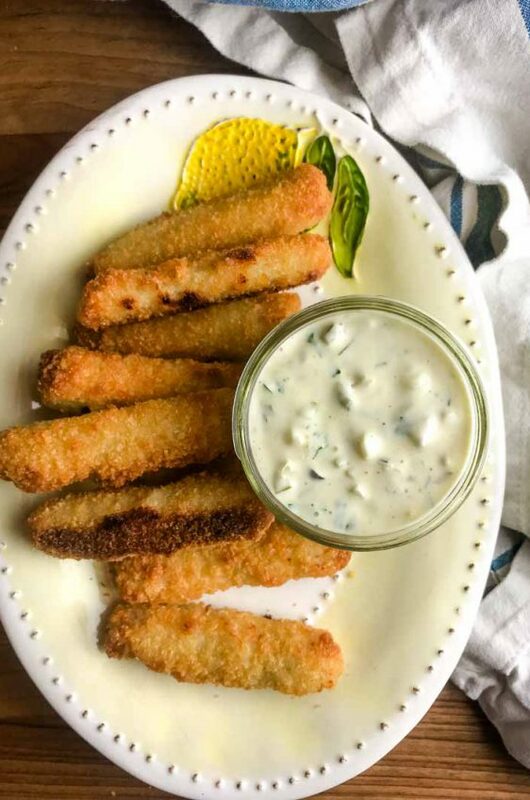 Lay fish on a serving platter and spoon sauce over the top. Serve. Note: Nutrition facts not guaranteed to be correct. I’ve tried to print it, but for some reason, when I click on the print button on the recipe it jumps back to the top of the page. Would you please advise me of what to do? So happy you love it, Linda! I am not sure why that is happening! Let me look into it? Can you tell me which browser you’re using? And do you happen to have pop-ups disabled? What can I used instead of basil? Hi Fio- The basil has a flavor all it’s own so there isn’t really anything that you can substitute. That being said, if you leave it out the tomato cream sauce will be equally as lovely! Used pollock instead as in the UK it is a more readily available white fish that’s inexpensive. Tasted wonderful and recipe now saved to make it again and again. Thank you! You are so welcome! I think this is pretty perfect for any white fish that you have access to! This was SO delicious!! Definitely a keeper. It was a hit with everyone. This was SO delicious!! Definitely a keeper. Made it and it was fantastic! I love the subtle but delicious flavor. It complemented white fish very well! I grated a block of parmesan, subbed in barramundi and organic half and half (that’s what I had in hand), and everything melded together perfectly. Thank you! Hi, what is seasoned flour? i dont cook much but would like to try this recipe! when u say cream…what kind of cream is it? My ABSOLUTE FAVORITE thing that I have found on Pinterest! The flavors are wonderful! I have to triple the recipe for my family because we all love it! Especially my 5 year old granddaughter! 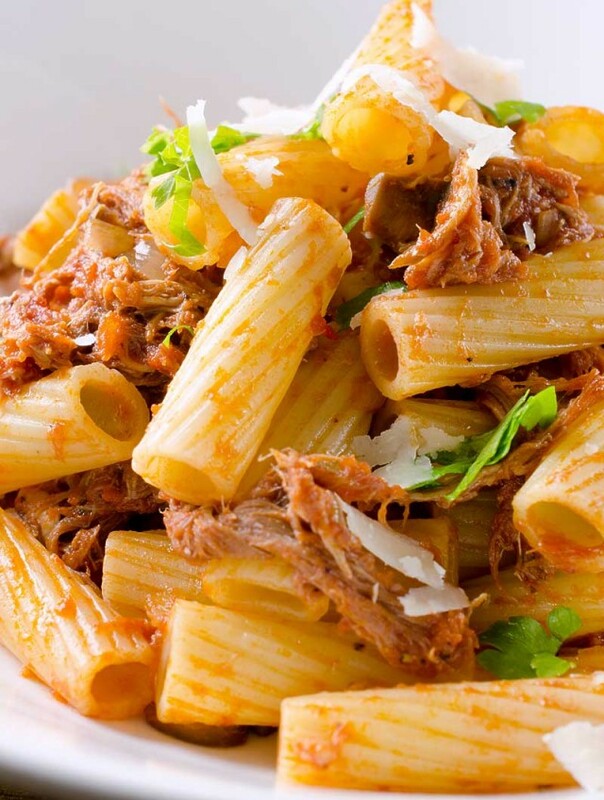 We serve it with brown rice and a vegetalble or salad, and it is perfect! I made this tonight and my husband yapped it up like a puppy! It was delicious. It came out perfect. Very good! I was looking for an easy way to make my tilapia patties that i’ve had in the freezer. This will be my go to tilapia recipe. sub sesame seeds for breadcrumbs to rock this! This is delicious! I made it tonight and everyone loved it. Took me a little while longer than “quick and easy” because I made my own breadcrumbs and had to go to the garden to pick tomatoes and basil. But a big hit. I will make this again. Again, another WOW for this recipe!. I searched tilapia with cream sauce and this came up. I planned on feeding some guests last night, but got home too late and everyone started getting antsy for food. I quickly threw this dish together (not hard to do with a large skilet and an extra helping hand). I served artichoke before main course as an appetizer, and threw my fish in the oven to stay warm, and the wait was totally worth it! The fish was a winner! Thanks for this awesome recipe. I am totally adding this to one of my favorites! Hey I’m actually new to your blog i’ve probably been a member for a good week or two and I’ve been drueling all over the pictures because I’m doing Lent so can’t make any of it yet. But today I needed to whip up something fast and I had Tilapia Fillet. I couldn’t ea it but my family loved it will make it again for sure and of course i will do it right after easter is over because it smelled soooo good that i just wanted to munch it down. Thank you for making this blog it is a wonderul thing and you are very talented to be doing this. Thanks again. Wow and again I say WOW!!! Just made this for dinner tonight and it was so good! I couldn’t believe it. Me and my husband both just kept going “mmmmm”. I will DEFINITELY be making this again. So easy but so light and fresh and just fantastic! Another awesome recipe, thanks! We loved it! HI! I just stumbled upon your blog the other day and love it! I cooked this tilapia dish and my husband said it was one of his top three favorite meals I’ve ever made for him. I paired this dish wish roasted zucchini and a baked sweet potato. Keep up the great work! thanks deseree, i hope my dad likes your recipe! i’m not really a fish person, but my dad eats a lot of fish. i’m kinda apprehensive to do sauces for him because most of the time he doesn’t appreciate it. i’m reading all these comments and it’s giving me a lil encouragement to try it. what i wanted to find out was….i saw u used panko breadcrumbs, i don’t know what that is, but i’m hoping that normal breadcrumbs could work? also….fresh cracked pepper means what? is it like black pepper?…or…red pepper flakes? hey belle, panko bread crumbs are Japanese breadcrumbs that are lighter and give you a crunchier texture than regular breadcrumbs. If you have a large supermarket near you, you can usually find them in the Asian food aisle. I have never tried this with regular breadcrumbs so I can’t say whether or not it would be good. Fresh cracked pepper is black pepper, I use a pepper grinder to crack the peppercorns when I need them, but you could certainly use ground pepper if you don’t have a grinder or peppercorns. Hope this helps! I’ve made this dish a couple of times since you posted and it is now a permanent member of our repertoire. 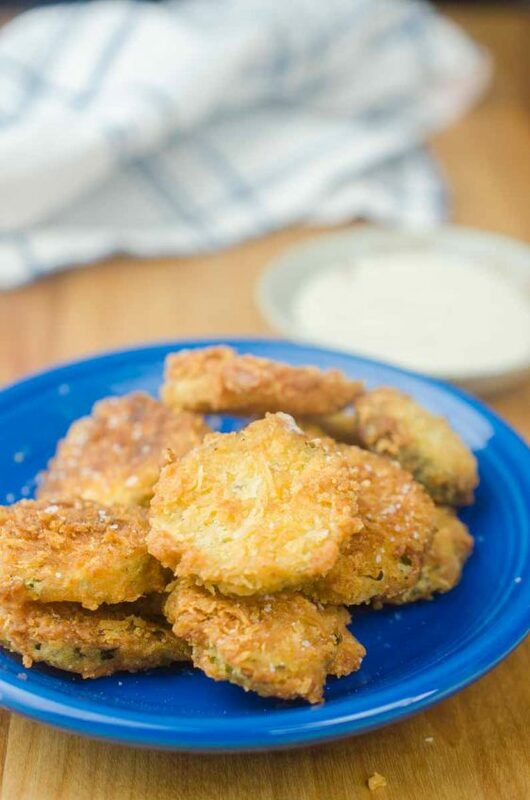 The panko and parmesan make a crunchy flavorful crust, and the creamy sauce really brings it all together. We served it over cous cous. Well done! The recipe calls for a half cup of cream. Is that half and half or whipping cream or what? Sandy: Sorry for being a bit confusing! I used heavy cream. Just made it and absolutely LOVED the flavors. I have a small kitchen, too, which now smells like fresh herbs and golden fried parmesan. This is definitely one of my new go-to meals for a weeknight–thanks! I hope you enjoy it Cookie! Honesty, this is the best meal I have made in a really long time. I don’t know if I can thank you enough. It was ridiculously delicious. Now that is a tasty way to enjoy some fish! I recently had a girlfriend as me for tilapia recipes so I’ll send this off to her. I love Tilapia cuz you can basically do anything with it since it’s so mild. It’s also usually on sale at our local Safeway so that makes it even better! I tried Panko breadcrumbs for the first time just a month ago and now I’m totally hooked! This looks like the perfect recipe and I can’t wait to try it! Thanks Marta! I buy a huge box of panko when I go to the Asian market because I use it for so many different things. You’re right it does add really great crunch. Oh that looks so delicious. I recently tried tilapia for the first time and love it! What a great spring meal. Love the sauce.